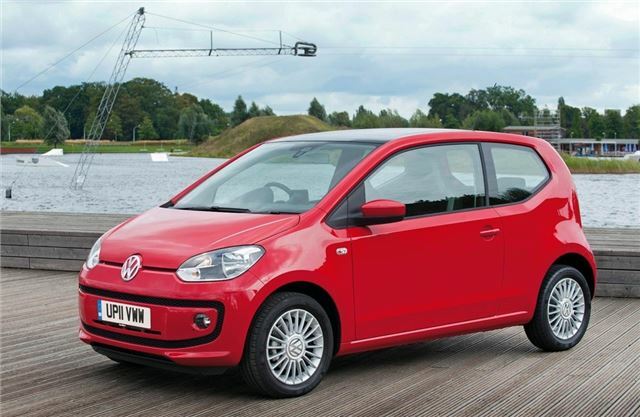 Volkswagen dealers are now taking orders for the new Up which is set to arrive in UK showrooms in Spring 2012. Prices start at just £7995 on the road for the funky little city which gets you the entry-level 1.0-litre 60PS Take Up. At the top end of the scale, the special edition Up White and Up Black models are price at £11,180. The Up will come with the choice of two 1.0-litre three-cylinder petrol engines as well as a BlueMotion Technology version. It has three doors and three trim levels – Take Up, Move Up and High Up – plus a special edition, the Up Black and Up white. A five-door version is expected to join the line-up in the second half of 2012. The range starts with the £7995 1.0-litre 60 PS Take Up which comes with body-coloured bumpers, daytime running lights, front and side head/thorax airbags, the new RCD 215 CD radio with aux-in, rear Isofix child seat mounting points and 14-inch steel wheels. Upgrading to the Move Up - priced from £8970 - adds remote central locking, air conditioning, electric front windows, easy-entry seats, a height-adjustable driver’s seat, variable-height load floor and 60/40 split folding rear seats. On the outside, the Move Up gains body-coloured door mirrors and handles. For £360 more, the Move Up BlueMotion Technology comes with a Stop/Start system that reduces urban fuel consumption by up to six per cent, battery regeneration and low rolling resistance tyres. These help improve average fuel economy to an expected 67.2 mpg, and reduce CO2emissions from 105g/km to a forecast 97 g/km – making it exempt from road tax. The £10,390 75PS High Up model gets heated front seats, a leather-wrapped steering wheel, gear lever and handbrake grip, electrically heated and adjustable door mirrors, the Maps & More personal infotainment device and a choice of dashboard colour. It also has front fog lights and 15-inch alloy wheels. Up black and Up white are special edition models costing £11,180. They are based on the High Up and come in black pearl or pure white metallic paint with chrome door mirror caps and door side strips plus 16-inch alloy wheels with body-coloured centre sections. Inside there is a body-coloured dash, special ‘stripes’ upholstery and carpet mats. Details of finance, maintenance and insurance packages designed especially for the Up will be announced nearer the car’s UK launch.